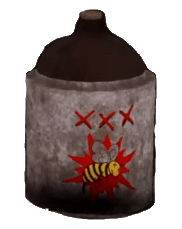 Mountain Honey is a Drink consumable in Fallout 76 (FO76). Players may use it item to regenerate water, health or obtain other benefits as listed below. Can be found in abandoned houses and cafeterias. To make 1 Fermentable Mountain Honey Moonshine you must have 3 boiled waters, 2 honey, 3 snaptail reeds, and 5 wood.